Both pieces will be issued under the authority given to the U.S. Treasury Secretary. They are not a part of a commemorative coin program brought about by the passage of legislation, although Senate and House bills introduced in the last 115th Congress did propose Mayflower $5 gold, silver dollar and 50c clad coins. Those bills died from inaction. Mintages for the Mayflower coin and medal have not been announced. The U.S. Mint, however, did say it intends sell each piece individually and also offer them paired with a coin to be produced by the British Royal Mint. On Tuesday, April 16, the U.S. Mint publicly unveiled candidate designs for the gold and silver collectibles before a two-day session of the Citizens Coinage Advisory Committee (CCAC). The designs came about after consulting with experts, the Mint said. "To develop the design portfolio, the Mint worked with a panel of subject matter experts who helped identify the concepts as well as the impact the Mayflower voyage had on the pilgrims, the Wampanoag Indians, and the history of our country," stated April Stafford, Director of the U.S. Mint’s Office of Design Management. CoinNews will hold off on presenting CCAC recommendations until after members of the Commission of Fine Arts (CFA) have reviewed the same designs. 2020 will mark the 400th anniversary of the Mayflower voyage. 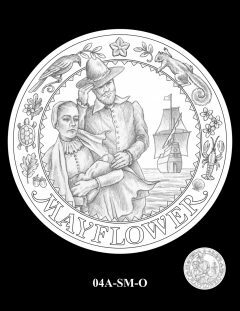 Carrying a group of people seeking a new way of life and religious freedom, the Mayflower set sail from England to arrive in a new world in late 1620, landing in Plymouth, Massachusetts — or Patuxet — as the Wampanoag people called the area. These two distinct cultures intersected as the Pilgrims endeavored to realize the lives they have envisioned. It is a complex history with multiple stories to be told. 01-GC-O depicts a landing party from the Mayflower — the first to include a family — as they approach the shore of the new land in late 1620. The silhouette of the Mayflower is seen in the background. Two mayflowers adorn the outer rim. The medal inscriptions include "1620," "2020," and "MAYFLOWER." 01A-GC-O presents the same composition with a border depicting flora and fauna native to "Patuxet," the Wampanoag name for the Plymouth, Massachusetts area where the Mayflower arrived. Inscriptions are "2020," "LIBERTY," and "PATUXET." 02-GC-O depicts a Mayflower family stepping out of the frame into a new life. The mother cradles her baby and the father holds his hat bracing against the cold and windy weather that foreshadows the challenges they will face. The silhouette of the Mayflower is anchored in the background. The inscriptions of "LIBERTY," "1620," "2020," and "IN GOD WE TRUST" reinforce their journey for religious freedom and a fresh start in a new land. 02A-GC-O features the same composition surrounded by local flora and fauna on the border, representing the homeland of the Wampanoag people. Inscriptions are "LIBERTY," "IN GOD WE TRUST," and "2020." 03-GC-O portrays a newly arrived Mayflower family standing firmly on land with apprehension about what lies ahead, but also with determination to thrive in unfamiliar surroundings. Inscriptions include "TOGETHER INTO A CIVIL BODY POLITICK" from the Mayflower Compact, along with "1620, and "2020." 03A-SM-O also features the same composition with local flora and fauna around the border, representing the land of the Wampanoag people. Inscriptions are "LIBERTY," "IN GOD WE TRUST," and "2020." 04-GC-O features a Mayflower family bracing against the cold and windy weather, foreshadowing their coming hardships, while the Mayflower is anchored in the harbor. The local flora and fauna on the border, along with a Wampanoag triangle design represent the Wampanoag homeland. Inscriptions are "LIBERTY," "IN GOD WE TRUST," and "2020." 04A-SM-O depicts the same composition but is formatted as a medal with the inscription "MAYFLOWER" arced along the bottom. 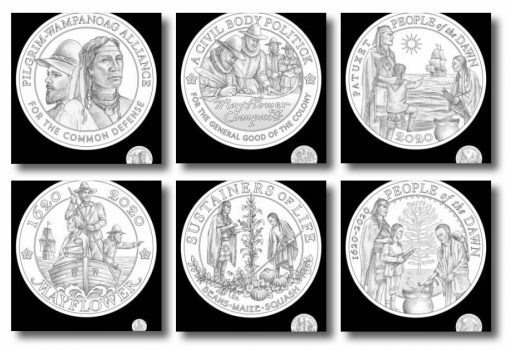 The next four candidate designs depict members of a Wampanoag family aware of the Mayflower’s arrival. The family stands outside of the border, representing their Patuxet homeland, while the ship sails toward the border of their world. 05-GC-O includes coin obverse inscriptions "LIBERTY," "IN GOD WE TRUST," and "2020." 05A-GC-R includes the reverse inscriptions "UNITED STATES OF AMERICA," "E PLURIBUS UNUM," and "$10." 05B-SM-O, formatted as a medal obverse, contains the inscriptions "MAYFLOWER," and "1620-2020." 05C-SM-R, formatted as a medal reverse, incorporates the inscriptions "PEOPLE OF THE DAWN," and "1620-2020." The next four candidate designs depict a Wampanoag family watching from the border of the design as the Mayflower arrives from foreign shores. A young boy steps on the border, representing the intersection of the Wampanoag people in their Patuxet homeland and the Mayflower passengers. 06-GC-O includes coin obverse inscriptions "LIBERTY," "IN GOD WE TRUST," and "2020." 06A-GC-R includes coin reverse inscriptions "UNITED STATES OF AMERICA," "E PLURIBUS UNUM," and "$10." 06B-SM-O, formatted as a medal obverse, features the inscriptions "MAYFLOWER," and "1620-2020." 06C-SM-R, formatted as a medal reverse, incorporates the inscriptions "PEOPLE OF THE DAWN," "PATUXET," and "2020." 07-GC-O depicts portraits of a Pilgrim man and woman, representing the beginnings of a transition from monarchy to democracy. The dual portraits symbolize a democratic organization, with their resolute expressions focused on a self-determined future. Included inscriptions are "LIBERTY," "1620," "2020," and "IN GOD WE TRUST." 07A-SM-O features the same composition, but formatted as a medal, utilizes the inscriptions "1620," "2020," and "MAYFLOWER." 08-GC-R depicts the signing of the Mayflower Compact by Mayflower passengers. Signed before they left the ship, the Mayflower Compact contained tenets that would later become the foundation for the U.S. Constitution and other important documents reflecting the core of our democratic principles. Inscriptions are "UNITED STATES OF AMERICA," "MAYFLOWER COMPACT," "E PLURIBUS UNUM," and "FIVE DOLLARS." 08A-SM-R uses the same composition, formatted as a medal with the inscriptions "A CIVIL BODY POLITICK," and "FOR THE GENERAL GOOD OF THE COLONY," excerpts from the Mayflower Compact. 09-GC-R features a Pilgrim and a Wampanoag Indian, depicted back to back in dignified and powerful portraits. They partner in cooperation, yet face away from each other with differing visions, agendas, and futures. Inscriptions are "UNITED STATES OF AMERICA," "E PLURIBUS UNUM," and "FIVE DOLLARS." 09A-SM-R formats the same composition as a medal and incorporates the inscriptions "PILGRIM-WAMPANOAG ALLIANCE," and "FOR THE COMMON DEFENSE," the primary reason for the alliance. 10-GC-R depicts the intersection of two cultures. Mayflower passengers arrived seeking a new way of life and religious freedom while the Wampanoag people seek to protect their existing homeland, culture and traditions. Inscriptions are "UNITED STATES OF AMERICA," "E PLURIBUS UNUM," and "$10." 11-SM-R depicts a Wampanoag man and woman employing a planting technique used to grow several crops that were staples for the Wampanoag people. This method helped keep the soil healthy, maintaining the resources for annual plantings and successful harvests. The inscription "SUSTAINERS OF LIFE" recalls not only this sustainable planting technique but the critical skills the Wampanoag people afforded to the Pilgrims by teaching them how to successfully plant and harvest the land. The additional inscriptions of "BEANS," "MAIZE," and "SQUASH" are arced across the bottom border. 12-GC-R depicts a Wampanoag family during the course of their daily activities. A traditional Wetu home is in the background with the smoke from its central fire rising through an opening in the roof. Inscriptions are "UNITED STATES OF AMERICA," and "E PLURIBUS UNUM." 13-SM-R also depicts a Wampanoag family during the course of their daily activities. A large White Pine tree in the background symbolizes the origins of the Wampanoag Creation Story. Inscriptions are "PEOPLE OF THE DAWN," and "1620-2020." The Mint is trying to duplicate, in a new way, its 1920 & 1921 commemorative silver half dollars, which celebrated the 300th anniversary of the Pilgrims arrival. Some nice designs here. I like the simplicity of the 01-GC-O design. 07-GC-0! After all it WAS about persecuted White Christians that made the transatlantic trip to the New World and a New Start Trusting in God for their survival. It wasn’t the indians land. They didn’t believe in owning land and they also immigrated from Asia. Way too much “diversity” nonsense and leftwing racism. The Mayflower Anniversary is a celebration of Western Civilization, the greatest, most advanced civilization on this planet. How about the Native Lenape (Delaware Indian Tribe) selling the island of Manhattan in 1626 to the Dutch for the equivalent of $24 at the time in wampum (shells, beads & trinkets) & now it is known as the wealthiest 12 miles of land on Earth)? Is that PC enough for you? Don’t tell me that the Native People’s already here before the explorers reached our shores didn’t “value” land in terms of “worth” when the foreigners came calling. UUUGGGGHHHH – horrible designs again. Surprised the Mint just didn’t cut and paste the bad Jamestown design on this coin and call it Pilgrims. Here is another one I won’t buy – especially at $35 over spot price. I would rather it were more about the Pilgrims’ achievement, for which half of them died the first winter, than about political correctness.